We’ve arrived at last! The home stretch of our November(ish) Charity Challenge. Five weeks of board gaming between Rachel and I, every night playing for the household board gaming championship while raising money for Toronto’s Sick Kids hospital. This is the first time in the competition’s history that we’ve made it to week 5 with the competition still in the balance. It should be exciting as we’ll be bringing our A-game and best game picks. If you’d like to donate to our Extra Life campaign in support of Toronto’s Sick Kids hospital please visit our campaign page here. Tonight Rachel gets to start the week with a pick after the Phase 10 debacle (the less said the better right?). Rachel is in a bit of a tough spot here, she plays plenty of games but because the competition has been so competitive AND we’ve made it into the fifth week she’s out of games where she really has a statistical edge or just plain feels confident she can win. So this week her picks are going to be just games she likes playing, most of which she has a 50/50 win % against me. So for tonight? Rachel is picking Clank! Clank! is many of my favourite things: A deck builder where you push your luck adventuring through a dungeon. In a deck building game you play cards to acquire more powerful cards. 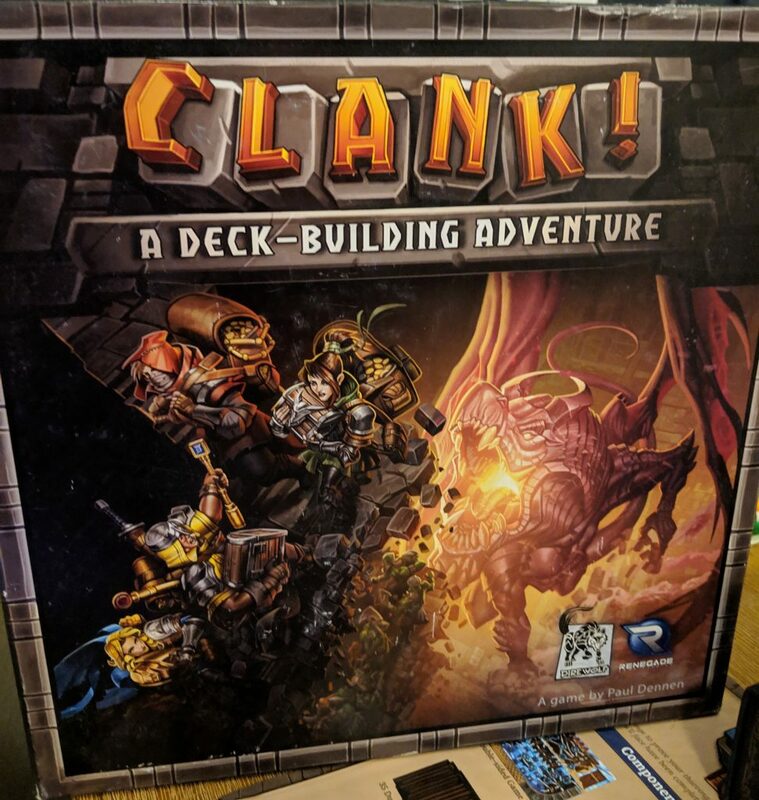 In Clank! 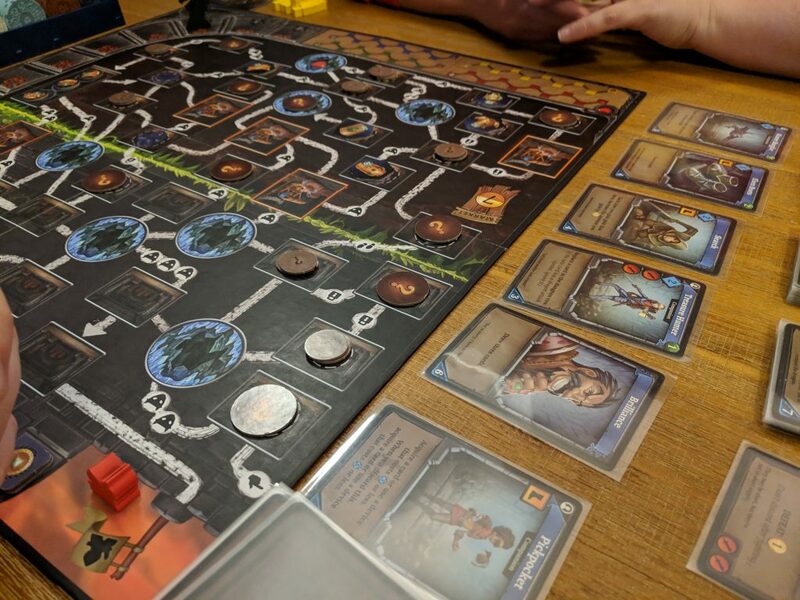 there’s an added complexity of a board that represents a dungeon you have to explore, acquiring treasure before the dungeon’s main baddy comes and kills you. The various cards you recruit let you move faster, fight bigger monsters and ultimately get better loot to score you points. 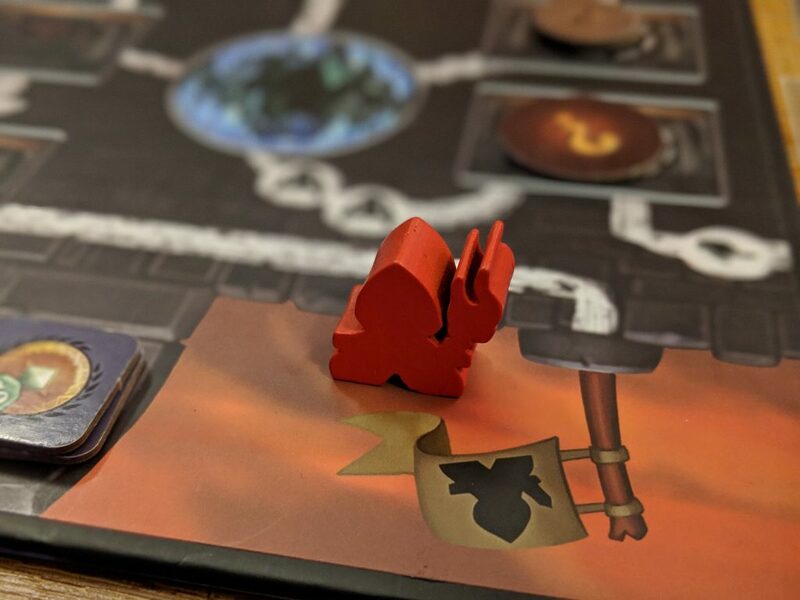 The game also has a push your luck element, meaning that you can either quickly go into the dungeon and not get much loot but end the game before others can get out of the dungeon OR you can go deep and collect a large amount of treasure, but risk getting killed by the dungeon’s inhabitants. Clank! is an absolute favourite of both of ours and I strongly suggest you A) get this game B) learn more by checking out this video. My strategy was to stay as close to Rachel as possible. I knew (and she confirmed it after the game) that she was going to try a quick smash and grab, going quickly into the higher tiers of the dungeon and forcing a quick end to the game. I stayed neck and neck and prevented this from happening. While we made our way down into the dungeon I managed to get a few items that gave me a bit of an edge. However while I had the items Rachel had a few cards that let her draw and play more cards. So while I had the right answers, she was able to pretty much draw all of her answers. It was really funny as we stayed on each others heels, literally going all the way from side to side, top to bottom. We both made it to the very bottom of the dungeon. Rachel managed to grab the 30 point treasure, I grabbed the 25 point treasure, the two hardest to get and most valuable treasures. Now it was time to make our escape and at this point we diverged. Because of my items I was able to take the locked path (I had a key that let me go places Rachel could not) while Rachel had to take the slower path. We both were so very close to dead, taking many hits from the dragon who’s treasure we had just spent the last hour stealing and running away from. But I made it within spitting distance of the end and felt in control, so much so that I veered of course and picked up some extra items. This would turn out to be my undoing. If you manage to escape the dungeon you get a bonus 20 points. If you don’t escape the dungeon (you die) and you manage to get half way out, you still score your points but you just don’t get the 20 bonus points. My greed, and veering off meant that after a few attacks from the villainous dragon I just couldn’t take it, I took too much damage and died. I thought the dragon would get Rachel as well but she managed to pull off another great set of draws and escaped, the bonus 20 points were in her hand and I thought that might seal it. In the end absent the bonus Rachel won by 1 point, but that’s not how the scoring works and alas she had that 20 point survivors bonus in her hand. The final score? 96 to 75 for Rachel. Our Century Spice Road game the other day was the most intense game of Century we’ve ever had. This was far and away the most tense game of Clank! we’ve ever had. The run up to the conclusion of this competition is proving to be brilliant and we’re both having a great time. Rachel has the first points of the week, but control is in my hands, and tomorrow I’ll be picking a heavier game to try and get my way back in the competition.